A curious geopolitical video game developer arms race has entered the next stage with a group of Iranian students unveiling a game that depicts the rescuing of Iranian nuclear scientists from the clutches of US and Israeli troops. The new title is described by its creators as a response to a game by US-based episodic game developer, Kuma Reality Games, whose game "Assault on Iran" has American Special Forces soldiers attacking an Iranian nuclear facility and destroying its centrifuges. "This is our defense against the enemy's cultural onslaught," said Mohammad Taqi Fakhrian, a leader of the hard-lined student group, Union of Students Islamic Association, according to an AP report. "Rescue Nuke Scientist" depicts Iranian Special Forces led by fictional Commander Bahman in their mission to rescue a husband-and-wife pair of nuclear engineers kidnapped by US troops during a pilgrimage to Karbala in Iraq. The Associated Press reports the game requires players to enter Israel to rescue the duo, kill US and Israeli troops and seize their laptops containing secret information. Last year when Kuma heard of the development of Rescue Nuke Scientist, they responded by creating a follow-up to their game titled "Assault on Iran, Pt. 3: Payback in Iraq." Kuma said the game picks up where they understand their Iranian counterpart will leave off. In Payback, Commander Bahman discovers that the scientists he rescued weren't really captured by US soldiers — but defected instead. Whoopsie-daisy. Screenshot from "Payback in Iraq"
Kuma said they don't intend for Payback to be seen as a — er — payback, but rather hope to establish a "serious political dialog." Because Kuma develops episodic content for an established game engine, Payback had a significantly faster turnover than Rescue. 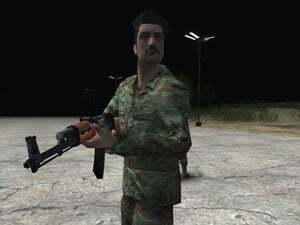 While Payback was released in 2006, the Iranian student group said Rescue has taken three years to develop. The group said it first plans to market the video game in Iran and other Muslim countries, and looks to bring the game to Western countries later on. The AP reports the game is from the same student group behind the "World Without Zionism" conference in 2005, where Iranian President Mahmoud Ahmadinejad called for Israel to be "wiped off the map," so you can probably venture to guess which way the game leans.